Our HR scanning services have successfully transformed the way our clients access and manage their employee records. As well as, many HR managers are finding that it is much easier and cost effective to manage the access, storage, removal and other GDPR requirements digitally than in hardcopy format. We have helped many medium to large size organisations to achieve their compliance and management objectives. How will the GDPR impact upon your HR department? How is the new GDPR going to affect how the HR departments process personal data and how our HR document scanning and management services can help you comply efficiently. If you would like to start managing your scanned HR documents more efficiently, our document management software is the perfect solution. Halogen has been specially designed in-house to provide lightning fast search and retrieval of your documents. The software was designed and developed with HR departments in mind with features added to make every day HR file management simple and stress-free. Numerous indexing fields can be added to the back end to let you narrow down searches by department, date or any other specification. You can also add notes as well as exporting, emailing and printing documents within the software itself. Consultation. We will work with you to understand the needs of your HR department so we can scan your documents exactly how you want them. This can be done via email or as an over the phone consultation. Collection. We can collect your documents in London and anywhere in the UK using our secure nationwide collection service. Preparation. Prior to scanning we will remove all of the fasteners (paper clips, staples etc) to ensure a smooth scanning process. Scanning. Your documents will then be scanned using our high quality, super fast document scanners with care taken to ensure your files remain in the same order they arrived. OCR processing. 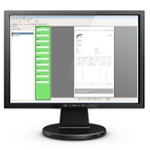 Optical Character Recognition (OCR) software can be applied to the scanned images to make the text searchable and editable. Quality checks. Our staff will complete quality checks on the processed images to check their accuracy. Conversion. Your scans can then be converted to PDF, TIFF, JPEG or any other file format you prefer. Indexing. We will index your files by previously agreed fields such as names, dates or reference numbers etc. to help you to organise and retrieve your digital files easily. Data delivery. All files can be encrypted to the highest level of encryption and we can deliver your documents on CD, DVD, USB or secure FTP. We can also host the files on our fully managed cloud system, Pearl Cloud or deliver them on our free document management software, Halogen. Secure shredding of documents. Once you are happy with your digital files, we offer three solutions for your original paper documents. We can return them to you, store them in our secure warehouse or shred and recycle them (providing you with proof of disposal).